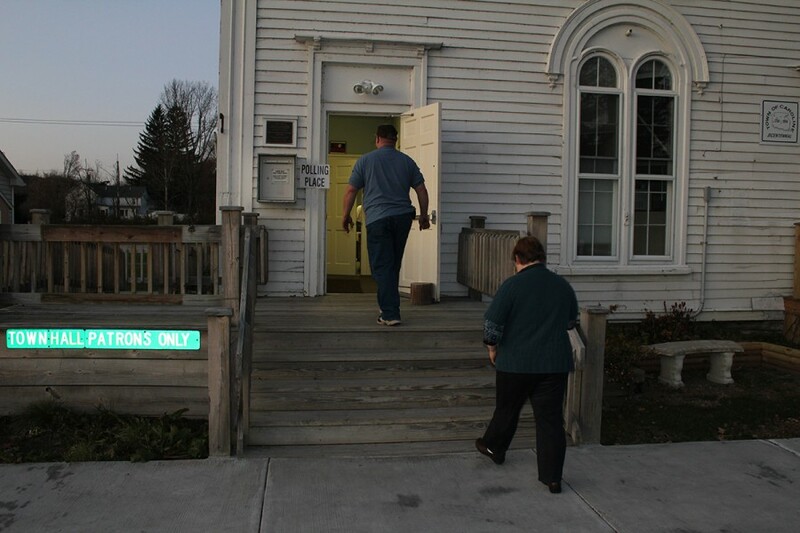 Residents of Caroline, in central New York, head to the voting booth in Town Board elections in November 2011. The vote would determine whether or not the town would allow fracking for natural gas. Photo by Jonathan Miller. If the current presidential race has soured you on the democratic process, you might seek solace in the latest episode of Scene on Radio, an excellent podcast produced by our old pal John Biewen at Duke University’s Center for Documentary Studies. The episode reprises two stories from Groundwork: Democracy Close to Home, an hour-long special hosted by NPR’s Scott Simon that first aired on public radio stations in July 2012. The first piece, reported by John, dives deep into the heart of a small fishing community in Alaska as it searches for ways to respond to unimaginably big changes in the ocean on which it depends. The second piece, by our Jonathan Miller, follows the intense (and ultimately transformative) debate over fracking in a small upstate New York town. Jonathan’s story starts at about 11 minutes. But listen to the whole thing; John’s piece is terrific.